The weekend was perfect. K and I spent some serious quality time together after a very hectic week. We had two date nights - Friday night dinner at L'Artusi and Saturday night at the movies (The Hunger Games!) and Kefi in the UWS. Sunday came around sooner than we wanted (as always) so we spent the day catching up with loved ones, studying, cleaning, and cooking. And now, without further ado, my first recipe post! I don't know about you, but I'm a big fan of BBQ anything. As soon as I found this recipe (via Pinterest) I fell in love - foodie love. And the recipe did not disappoint! (The only slight change I made was that I uncovered the chicken after 4.5 hours so that the sauce would thicken.) This BBQ chicken was easy to make, required very few ingredients, and was absolutely delicious! 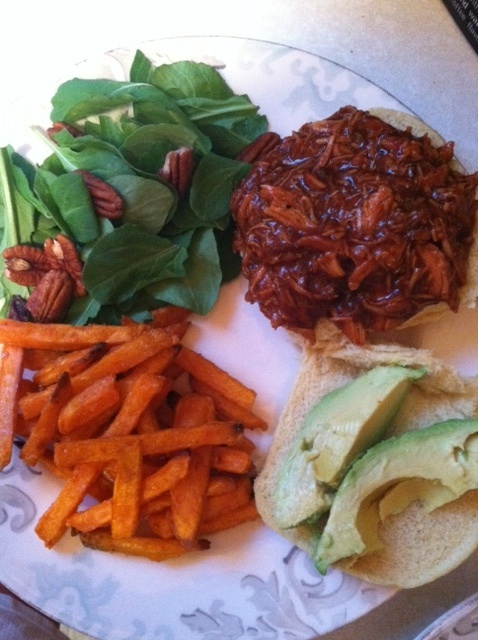 I made BBQ chicken sandwiches and served them with a simple salad and some baked sweet potato fries. Serious YUM! p.s. Do you have any good crockpot recipes you'd like to share with me?! p.p.s. Have you entered the Pom Flair giveaway? Only 3 days left! why yes, yes i do have some crockpot recipies. or recipe...the kitchn's barbacoa beef. AMAZING! Ohh looks great. I haven't used my crockpot in a while, but I've done short ribs that were delish. It was on pinterest. I'll def try your recipe! Ooooo that looks SO yummy! Especially the sweet potato fries! I also saw Hunger Games this past weekend and did lots of going out to eat! i have been craving bbq so bad lately! this looks beyond excellent. i think i'll have to try it sometime! I'm trying this recipe this very weekend. That sounds amazing! I need a crock pot! Ohhhh my gosh this looks amazing! And no I sadly don't so I have one lonely crockpot. We must chat and develop our own little recipe list. Maybe create our own?! Yum! Sounds delicious and easy to make! Oh my yum! I love that you added avocados! This looks amazing....I'm a huge fan of bbq chicken.